But that news has not been confirmed till now and neither we are seeing any signs of that dream becoming true at least in near future. But the semi high speed trains are going to launch very soon in India. That's a confirmed news by Minister of State for Railways, Mr. Rajen Gohain and it can be seen before the ending of 2018. Recently the semi high speed train completed its trail run successfully in its prefixed route. In the trial run, it touched 180 Kmph speed and even more. Experts say that it can run with speed upto 200 Kmph. 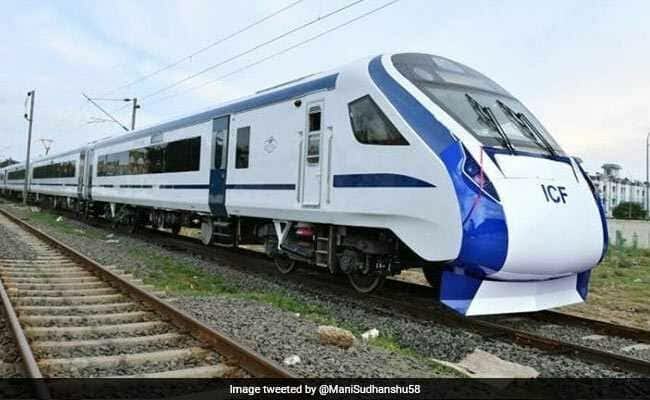 The first semi high speed train of India has been manufactured at a cost of 100 crores by ICF (Integral Coach Factory) in Chennai. It means, the train will be a "Make in India" initiative that was inspired by PM Modi. It has world class facilities in it. The train had a total of 16 coaches. Among them, two are executive class coaches with 58 seats each and the other coaches have 78 seats each. All the seats are 360° rotatable. The train can adjust its dimensions according to the platform and the sliding doors also will be automated. The train will not need any engine as each and every coach will be accelerated by their own motorised wheels and the both sides will have separated coach for the drivers. Their will be special arrangements for disabled persons also and the passengers will get high level of comfort during the journey. Rather than these, the train will be packed with Wi-Fi services, CCTV surveillance, GPS-based information system, touch-free bio-vacuum toilets, LED lighting and Emergency talk-back feature to communicate with the train crew at the time of emergency. The train has not get its official name till now. It will be named later but for now it will be called as the "Train-18" where '18' will represent the year 2018, the inaugural year of the train. It will replace the Shatabdi Express in India and will run between Delhi and Varanasi for now. It will take halt at the stations Ghaziabad, Kanpur and Allahabad stations and will compete its journey in just 8 hours. Before it took 12-17 hours to travel the distance between Delhi and Varanasi. It will start its first journey from Delhi at 6 AM on 29th December and reach Varanasi at 2 PM. On return, it will start from Varanasi at 2:30 PM and reach Delhi at 10:30 PM. The train will be inaugurated by the honourable Prime Minister of India, Mr. Narendra Modi on 29th December. Train-18 has touched 181 kmph speed on its trial run but it will run with speed of 130 kmph for now as the CCRS (Cheif Commissioner of Railway Safety) demands safety fencing and regular greasing on the tracks especially on the curves of the route. After the process of fencing is completed fully, the Train-18 can run with a speed of 160 kmph and beyond, says Railways officials. With the Train-18, the Indian Railways are going to touch new heights and the dream of a better India is being true slowly. The next big step of the Indian Railways is the "Train-20" project, the next generation aluminium bodied sleeper class trains, that can be launched in the year 2020 and replace the Rajdhani Express.